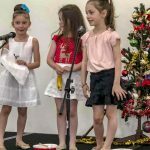 On Tuesday the 4th of December our Greek Schools Committee held the Annual Greek School End of Year event featuring poems, plays and songs from our beloved Greek School students. The event attracted over 150 people which was held in the newly built Greek Orthodox Church of St. Anthony Community Centre. There were some great highlights throughout the evening. 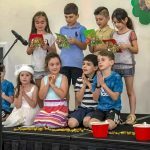 Our parish priest Father Nicholas Pavlou commented at the end of the event how the student’s performances were fantastic and how we all should be proud of our Greek Language Schools here at St. Anthony’s. Our wonderful MC for the evening was one of our well-known and experienced teachers, Mr. Nick Velkos who kept us all glued to the stage with his knowledge of the pieces that were performed by our students. 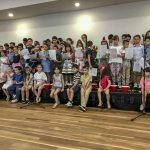 The President of the Greek Orthodox Archdiocese and the Greek Orthodox Church of St. Anthony – Mr. Con Dalas concluded by thanking all our teachers for their hard work throughout the year under the watchful eye of our loved principal, Mrs. Militsa Papacharalambous. Mr. Dalas also made a special mention about the excellent support received from the Ethnic Schools Association which without this support, our Greek Language Schools would not be here. The evening ended with the students receiving their End of Year Report cards as well as a small gift from Father Nicholas. We are all looking forward to 2019..!